Car is located in Romford, Essex. What's app would be fine for sending photos. Temperature gauge on the dash doesn't work, new sensor is included with sale. I have removed the fuse from the radio and the drain has disappeared (it just needs to be wired in properly). VW Lupe 1.0e just had new Plugs, Leads, oil and filter service. 3 owners from new last owner change 2011. The car has its original stereo but can upgrade to a Bluetooth Sony stereo for £60 extra. This vehicle is nearly 20 years old and therefore not a new car. VW Passat SE TDI 140 for sale spares or repair. I managed to catch it before the engine run away with itself. It doesn't turn over, so assuming oil was sucked into the cylinders. Pretty good all round condition, regularly serviced and looked after well. VW bora 1.9tdi PD100. Located in Wakefield. Good 'budget' tyres all round with plenty of tread. Great engine, pulls well with no knocks or bangs. Very tidy car for its age, very few age related marks on the body. Black Leather Heated Seats. Sat Nav IPhone and Android compatable. Full service History. VOLKWAGEN EOS 2.0 TDI CR 140. Orginally 2010 hidden behind a privet reg. Along with any thing else i have for it. I have been as honest as i possibly can with this car. turbo was new and hybrid mod was carried out from midlands turbo january 2018. 2007 EOS.6 speed manual with full history, both keys and a new mot. The car has a main dealer history to 75000 miles and specialist since. Could be interested in a van px.. requests for the reserve will be ignored. Electric hood in working order. Electric windows. New battery and starter motor. 4 previous owners. Excellent runner. Good tyres. Vw beetle. Inbox for more info £600 Ono. Volkswagen golf cabriolet mk 3.5. Been sitting for 3 years. Head gasket gone, flat battery. starts and drives for loading purposes only. Drives great and looks great. Volkswagen Passat CC GT 2.0 TDI 170BHP 185K Miles extremely well maintained so dont let the mileage out you off, still drives excellent Mot December with no advisories Dsg gearbox, changes gears very smooth Rare Tanned heated leather seats Sat nav DCC Cruise control Parking sensors Central locking Electric windows Privacy glass Hpi clear In good condition apart from a few minor age related marks Nationwide delivery 07575756525. My vw 1.9tdi bora was running perfect until pulling on my drive one night and lost all boost could be as simple as boost pipe gone! And car has been sat since. Volkswagen Golf VR6 HIGHLINE 3 door hatchback 1997 as can be seen from the pictures this is a very clean tidy strait example of one these iconic sporty golfs, the cars not show stomping condition but it a nice one. 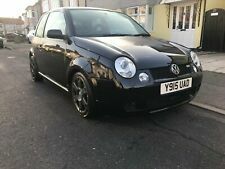 2002 VOLKSWAGEN LUPO 1.6 GTI 6 SPEED!! [ ] 6 speed gearbox. Only reason for sale is i don't use the car enough due to having a van as my daily. - [ ] Lowered on coil overs. The car drives perfectly and pulls strongly in every gear. Both the Interior & Exterior of this car are in very good condition.